Signal Film and Media is delighted to announce The Ballad of Barrow Market will be performed live in Barrow Market on Saturday 7th April 2018 at 1.30pm. The free show is part of their exciting Heritage Lottery-funded project MARKET TALES and will mark the culmination of all the research and activities which have taken place over the past six months. The theatre piece is inspired by real-life memories local people have shared about the popular market. 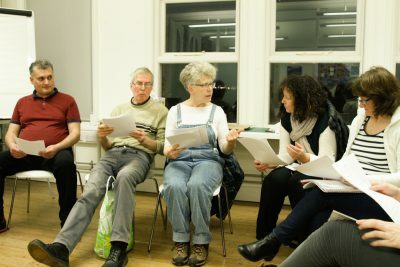 Volunteers collected oral histories, photographs and films which were used as a basis for creation of a range of colourful characters and stories during a six-week creative writing course led by writer Kate Davies. During the creative writing process, the group watched films, listened to sound and looked at archive photographs and writing, which inspired the script’s content and sometimes fed in directly. The play is structured as eight short performances linked by ballads. The piece kicks off with the story of the ‘Banana King’, a stall holder obsessed with the yellow fruit, and then parades around various stalls past and present, from the haberdashers and milliners, from the site of the old outdoor market to the stall selling ‘unmentionables.’ The result is an entertaining, sometimes moving and at others hilarious exploration of the lives and culture of the market past and present. The play is being performed by 14 local young people and adults who are members of Theatre Factory Young Producer company, backed by members of the community. It will last between 45 mins and 1 hour and is directed by Rachel Ashton, Karen Whatley and Phill Gregg. Theatre Factory is a programme of drama activity by, for and with young people in the Furness Peninsula, run by The Ashton Group. Theatre Factory provides the opportunity for young people to collaborate with practising professional theatre Directors, Writers, Designers and Technicians to make brand new theatre performances that spring from their own ideas. Kate Davis who is ran the creative writing workshop is a writer from Barrow-in-Furness with a particular interest in poetry and in the landscape and geology of the Furness Peninsula. She has taught creative writing for 20 years working in a huge range of settings; with community groups, in schools across the north of England, for the Ashton Group Theatre Company, the Whitworth Art Gallery and Heron Corn Mill. Her poems have been published in Iota and Muse, broadcast on BBC radio and printed on shopping bags, while her stories have been installed in street furniture, in the primates section of Manchester Museum’s natural history display and at Art Gene. She gained an MA Poetry from Manchester Metropolitan University in 2011 and in 2013 was awarded a Northern Writers Award. Her collection of poetry will be published in June 2018 by Penned in the Margins. Thirteen local writers have contributed to The Ballad of Barrow Market, they include: Caleb Staples, Craig Lochhead, Derek Bradley, David Clancy, Brenda Fishwick, Duncan Macmillan, Christine Lees, Ellis Dunn, Jean McSorley, Polly Wright, Lee Wicks, Ravi Jeyendran and Victoria Tighe. A huge thanks to them for all their hard work!